On 3 June 2013, the Primate of the Russian Orthodox Church met with the Prime Minister of the Hellenic Republic, Mr. Antonis Samaras. They were joined in the meeting, which took place at the prime minister’s working residence, by His Beatitude Archbishop Hieronymos II of Athens and All Greece, Metropolitan Hilarion of Volokolamsk, chairman of the Moscow Patriarchate’s Department for External Church Relations, and Metropolitan Prokopios of Philippe, Neapolis and Thasos. Prime Minister Samaras and His Holiness Patriarch Kirill shared recollections of their last meeting in Moscow in January 2012. 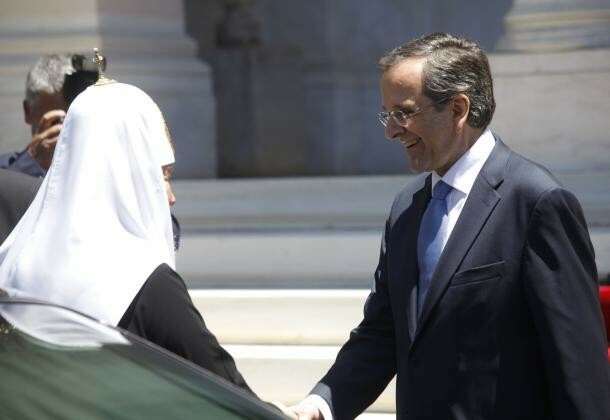 According to Mr. Samaras, he learnt that the Russian Church was going to render her assistance to those who had suffered from the economic crisis in Greece. The assistance has been rendered, and we are thankful for it, he said. As to the difficulties his country is undergoing, he believes that the Greek people are strong in spirit and will cope with the present trials with God’s help and through the prayers of the Mother of God. Also discussed were the Middle East problems, and the situation of Christians in the countries of the so called Arab spring in particular, as well as the issues of pilgrimage, the life of the Russian-speaking compatriots in Greece; the role of the Church in the life of society and the defence of spiritual values in the contemporary world.